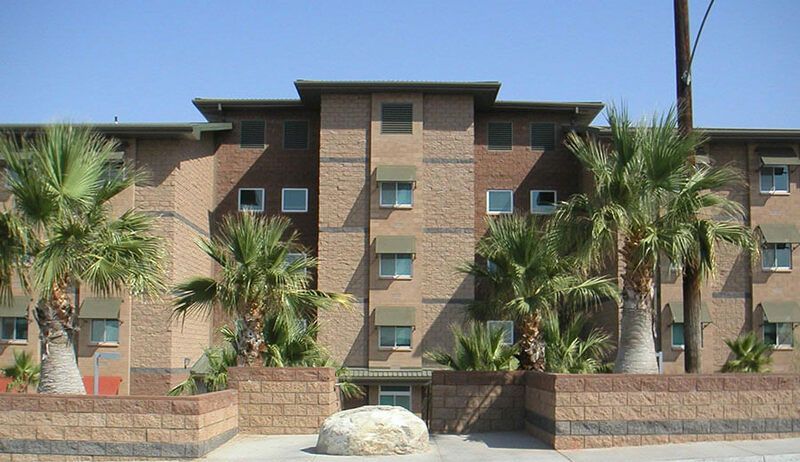 The innovative design developed by Soltek for the P-623 Bachelor Enlisted Quarters located at the Marine Corps Air Combat Center in Twenty-nine Palms, CA has become the U.S. Navy’s modern standard for enlisted personnel housing. This four story, 95,000 sq. 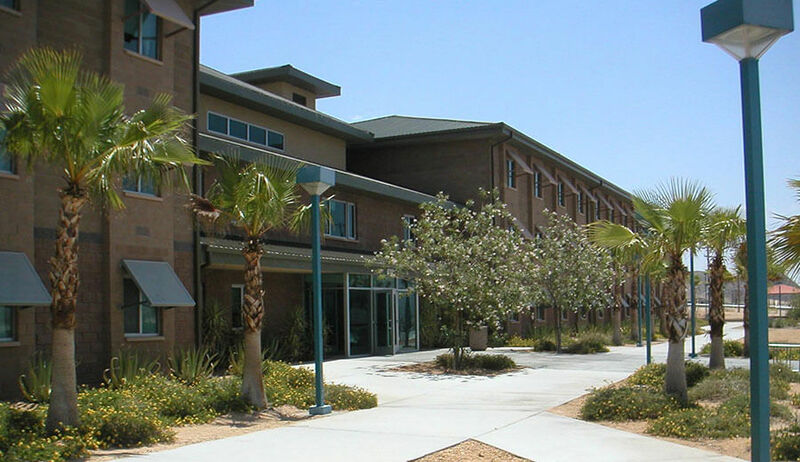 ft. facility compliments the surrounding desert environment with a mix of split-faced and precision masonry walls and an attractively colored insulated standing seam metal roof. 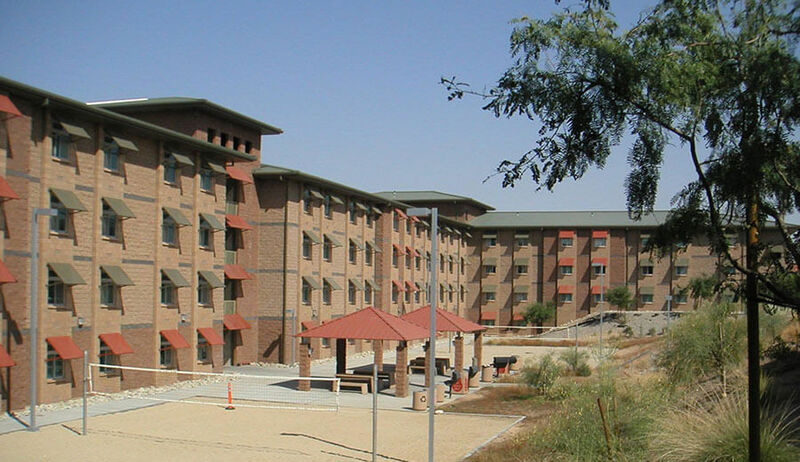 The BEQ provides accommodations for 384 enlisted personnel, with semi-private bathrooms, community spaces, and service core areas with laundries, lounges, administrative offices and multi-purpose rooms. Soltek’s well-thought design fully considered the challenges inherent to the local environment, and considered these elements in the final design. 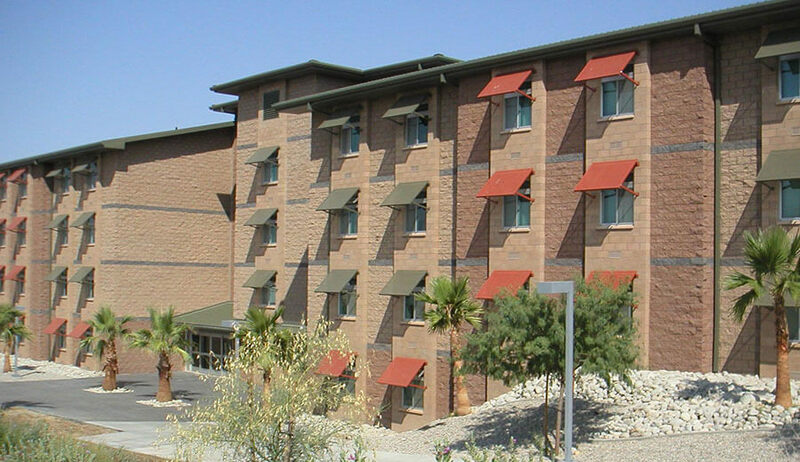 This included siting the building to reduce solar heat gain, along with the use of sunshade canopies over the unit windows. Highly durable yet sustainable features were included throughout to minimize maintenance and increase the facility’s life, including native plant materials, decorative rock mulches and numerous finish products developed from recycled materials. As a prominent feature, Soltek’s design included the use of a redundant mechanical system to ensure continuous operation during hot weather periods. The design of the structure included a combination of steel brace frames in support of the masonry shear walls to meet progressive collapse requirements. The facility also incorporated all new AT/FP standards, including proper set-back distances and blast resistant doors and windows. Additional features include colored sidewalks, covered outdoor barbecues, and basketball and sand volleyball courts.